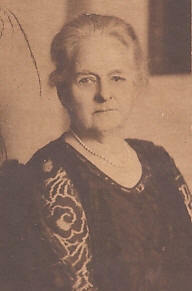 Mary (Mamie) Lawton, ("Mrs. Walton"), was born Mary Craig, March 31,1855 in Louisville, KY. Since the late1860's the family lived in Pewee ("Lloydsboro") Valley at Edgewood. Mamie married Henry Ware Lawton on December 6, 1881. A devoted wife, she insisted on following her husband wherever he went to serve, from the Indian Wars until his death in the Philippines in late 1899. She was devastated by his death in battle, and continued to wear the black of mourning for the remainder of her life. While on her "tour of duty" with the General, she was already known as a writer and somewhat a war correspondent back at home in the United States with her frequent letters from the front published in newspapers across the country. Life well could have continued for her in this manner if General Lawton had not become the only General of the Spanish American War to have died in combat. We may never have known her as the "Mrs. Walton of the Little Colonel books. When Mrs. Lawton returned to the United States in 1900 in relative poverty without the General's income for support, and to pay off the debt for their home in Redlands, California, she moved to Louisville (and a house that is a center for much of the story of The Little Colonel's Holidays.) A national subscription for the family of the fallen hero helped pay off the debts and for a new home, The Beeches, in 1901. Because of the close knit circle of friends and relations in Louisville and Pewee ("Lloydsboro") Valley, Mrs. Lawton became a close friend of Annie Fellows Johnston and with her charm and imagination, a significant character and contributor to the stories. She lived at "The Beeches" until 1911 when she sold the house to Annie Fellows Johnston and moved with her family to Annapolis, MD. 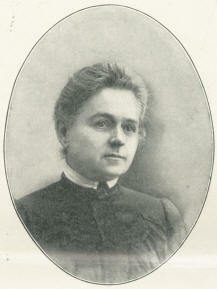 She died on January 5, 1934 in Annapolis. She is buried next to General Lawton at Arlington ( Section 2, Grave 841). Mrs. Lawton at Home, an article from Harper's Bazar, April 28 1900. This appeared a few months after General Lawton's death and just before Mrs. Lawton was introduced to us as Mrs. Walton in The Little Colonel's Holidays. In fact, some of the pictures in the article might give a pretty good idea of the decor of the "Home of a Hero" described in Chapter 12 of the same book. Mrs. Lawton would not remain long at Redlands. Soon she moved to Louisville, where she stayed for about a year until "The Beeches" was completed. Group Photo near Fort Huachuca, Arizona, 1880s, includes the ladies. This photo is from a private collection of General Lawton's great granddaughter, and is used with her gracious permission, and is thus to be found nowhere else in publication. And of course, you can read all of the Little Colonel books from The Little Colonel's Holidays to The Little Colonel's Knight Comes Riding. In each of those the fictionalized version of Mrs. Lawton, aka Mrs. Walton comes alive with much the same personality she had in real life.